In 1966, Jacques Derrida gave a lecture at Johns Hopkins University that cast the entire history of Western Philosophy into doubt. 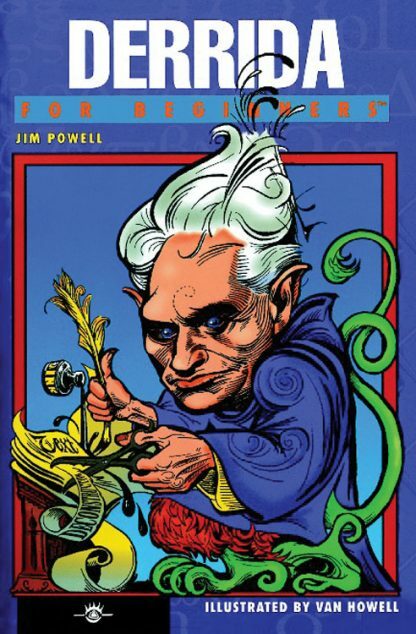 The following year, Derrida published three brilliant but mystifying books that convinced the pollsters that he was the most important philosopher of the late 20th Century. Unfortunately, nobody was sure whether the intellectual movement that he spawned � Deconstruction � advanced philosophy or murdered it. The truth? � Derrida is one of those annoying geniuses you can take a class on, read half-a-dozen books by and still have no idea what he�s talking about. Derrida�s �writing� � confusing doesn�t begin to describe it (it�s like he�s pulling the rug out from under the rug that he pulled out from under philosophy.) But beneath the confusion, like the heartbeat of a bird in your hand, you can feel Derrida�s electric genius. It draws you to it; you want to understand it... but it�s so confusing. What you need, Ducky, is Derrida For Beginners by James Powell! Readers will learn the coolest Derridian buzzwords (e.g., intertextuality, binary oppositions, hymen, sous rature, arche-writing, phallogocentrism), the high-and-low lights of deconstruction�s history (including the DeMan controvercy), and the various criticisms of Derrida and deconstruction, including Camille Paglia�s objection that America, the rock-n-roll nation, isn�t formal enough to need deconstruction.